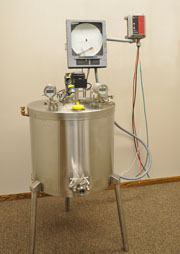 We feature 15 Gallon and 30 Gallon pasteurizer and cheese vat built in the U.S.A. Both units are now 3A and FDA approved for use in any state in the country and are in stock for quick delivery. "THE VAT" is built in Dayton, Ohio, USA by Northwestern Tools, parent company of JayBee Precision Inc., and is available in two sizes, a 7 to 15 gallon (26 to 56 Liter) and a 17 to 30 gallon (64 to 112 Liter) version. Built of durable stainless steel construction, "THE VAT" is delivered ready for operation and utilizes 220 single phase service suitable for use in any country world wide.